The Target Archer Farms brand products are really quite good. I enjoy their ice cream, spice mixes, potato chips, and the hot cocoa mix you see in the photo. 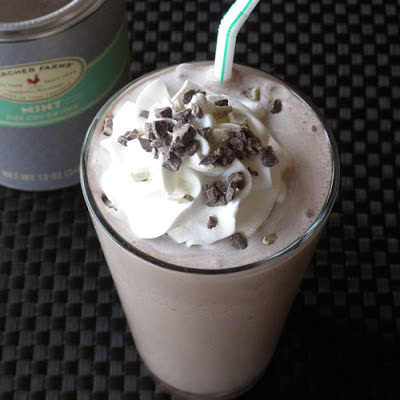 I first tasted this shake at SuperTarget, from a sample lady who was making them right there in the store with the Market Pantry vanilla ice cream and the Archer Farms Mint Hot Cocoa Mix. Being a lover of mint chocolate chip ice cream and other chocolate mint combos, I loved this. And it was so simple. And I already had the hot cocoa mix at home. Since I love the Archer Farms Madagascan Vanilla Ice Cream so much, I bought that rather than the Market Pantry. I like high quality ice cream. If I'm going to fill my body with fat, I'm going to do it with at least a little bit of style and good taste. What I like about this "recipe" is that I can make a little or a lot. It's not like baking a whole cake that will sit there begging for me to eat one more slice, or that I have to plan to have people over for. I can make a shake just for myself or to share with my eating buddy, Ezra. The shake you see pictured is already in my belly, and I'm calling it breakfast and lunch. It was delicious. Oh, and it's topped with Andes Mint Baking Pieces. I had them left over from the Mintereoos I made a couple of months ago, and I needed to use them up. They're optional, and actually, they just get stuck in the straw. I just thought they'd dress up the shake nicely for the picture. Same with the whipped cream. It's pretty redundant on an ice cream shake, but it looks nice. So, there you go. Here's the super easy recipe for a super delicious decadent treat. Place the ice cream, cocoa mix, and 3/4 cup milk in a tall plastic tumbler that will hold it all and give you at least 3 inches space at the top. Put in your hand blender and mix until completely mixed. Add more milk if you want a thinner shake. Stick a straw in it and enjoy; or pour into a classy glass, top with whipped cream and minty bits and enjoy. Place the ice cream, cocoa mix, and 3/4 cup milk into the blender. Put the top on and blend until smooth. Add more milk if you want a thinner shake. Pour into a glass and top with whipped cream and minty bits, if desired. Stick a straw in it and enjoy.